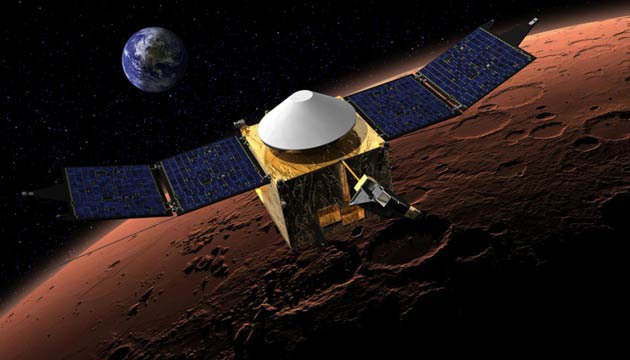 On September 21, NASA's MAVEN (Mars Atmosphere and Volatile Evolution) spacecraft will go boldly where no one has gone before: to the very top of the Martian atmosphere! One might ask, with all of the amazing imagery and mind-opening discoveries made by the fleets of orbiters, landers and rovers that have explored Mars' surface, why is anyone interested in the rarified gases at the highest layers of Mars' already rarified atmosphere? The answer, as it turns out, is a tale of two planets: Mars and Earth. When we first started to explore Mars with robotic spacecraft in 1965 and compared it to our home planet, we were struck more by the differences between the two than the similarities. Our home world is wet, vibrant and greenly alive, while rusty-red Mars was found to be dry, desolate and lifeless -- more like our Moon with a thin wisp of atmosphere. Over a campaign of exploration spanning decades, we have gathered a great deal of observational data that has told a much more nuanced story of Mars: a wet, active and far more Earth-like Mars than imagined even in a lot of science fiction. The reason we failed to see the similarities at first is that it required looking across a gulf of time, and it takes time, and data, to reconstruct an accurate picture of the past. Mars, we now know with fair certainty, once had a thicker, warmer atmosphere and a water cycle with precipitation, river systems, and wide shallow, likely salty seas. Whether life ever emerged on Mars is still a question, but the environment we are sensing a couple billion years in the past feels temperate and inviting. So what happened? Why is Mars today a cold, dry desert world with an atmosphere a hundredth as thick as Earth's? Where did its warming, protective atmosphere disappear to -- and could the same thing happen to other planets, even Earth? That's where MAVEN comes in. MAVEN's scientific instruments are designed to characterize the nature of not only the upper Martian atmosphere and ionosphere, but its interaction with the solar wind: the stream of electrically charged particles that blows constantly from the sun and across all of the planets of the solar system. Is Mars' atmosphere a mostly-deflated leaky balloon? The action of high-speed ions in the solar wind scouring volatile molecules (like carbon dioxide, nitrogen dioxide, and water) from the exposed upper layers of Mars' atmosphere and carrying them away into space could account for the loss. Mars' atmosphere, it seems, is a balloon with a slow leak, now mostly deflated. If MAVEN determines that the solar wind has indeed eroded Mars' atmosphere into space, does that mean the same thing will happen to Earth? This may be where one of those stark differences between Mars and Earth becomes important: a global magnetic field. Earth has one: a global dipolar magnetosphere generated by currents deep inside our planet and emanating outward into the space surround it. The solar wind's particles are ions -- electrically charged hydrogen nuclei for the most part. When an electrically charged particle moves through a magnetic field, its path is deflected. That's how an old-style television set (pre-flat screen CRT, or cathode ray tube, technology) deflects a beam of electrons to paint a luminous picture on the phosphorescent screen. Earth's atmosphere is completely enclosed within the larger volume of space occupied by the magnetosphere, so it is shielded from the mayhem the solar wind probably inflicts on the bare, unprotected ionosphere of Mars. So erosion of the Earth's atmosphere is not presently a big concern, though it would be if we ever lost that protection. Mars, however, does not have an active global magnetic field today, and may not have had one for a long time now. Past orbiter missions have detected patches of localized magnetic fields emanating from the Martian crust, which may be the "fossil" remnants of a global field that sheltered Mars in its warm and wet youth, but their influences are weak, scattered, and do not extend to the higher regions of Mars' atmosphere. Understanding exactly what is taking place where the solar wind collides with Mars' atmosphere will give us better insight into its loss over time, and how the surface environment has evolved in response to that loss. In turn, we may be getting a glimpse of what could happen to the Earth in the hopefully very distant future. Amazing what studying a few sparse molecules can tell you.